Several years ago, in the thick of research and development for a major public history project about Brooklyn’s waterfront, I found myself calling a long list of New York City government phone numbers. My goal was simple but elusive — to figure out exactly how many miles of coastline there were in the borough of Brooklyn. I had scoured books and articles — to no avail. City reports on the waterfront are plentiful — especially in the years after the devastation of Superstorm Sandy — yet still no luck. But I’m a historian, and we historians can be pretty dogged about research. About ten phone numbers into my list of government agencies, I hit the jackpot — Michael Marrella, Director of Waterfront and Open Space Planning at the Department of City Planning, picked up his phone, and I had my answer (131 miles). Since 2014, I, along with a team of Brooklyn Historical Society historians, have been digging deep into the untold histories of Brooklyn’s waterfront. We have looked at thousands of years of the waterfront’s history through the lenses of social history, environmental history, art and culture, race and ethnicity, queer and gender studies, and much more. We have drawn on the robust resources at Brooklyn Historical Society’s landmark Library & Archives, and at dozens of other repositories around the country and the world. 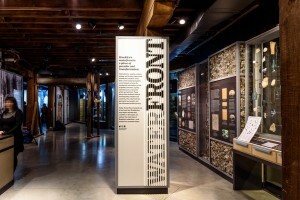 Our research culminates today, with the opening of WATERFRONT, a new exhibition and multimedia experience opening in Brooklyn Historical Society DUMBO. This is the Society’s second location. It is the sole cultural institution in Empire Stores, a redeveloped 19th-century warehouse on the DUMBO end of Brooklyn Bridge Park. In a lot of ways, my hunt for the magic number “131” is reflective of the privileges and challenges of this massive research undertaking. So many aspects of Brooklyn’s waterfront history — the building of the Brooklyn Bridge, the On the Waterfront-esque depiction of longshoremen and mob corruption, the industrial powerhouses like Domino Sugar factory — have taken on iconic, even mythic meaning in American popular culture. Yet the Brooklyn side of the East River has gotten much less attention from historians than the Manhattan side has, and many parts of the borough’s past remain misunderstood by the general public. This Manhattan-centric approach to the history of New York is something that we historians of Brooklyn have gotten used to. It simply means that to tell the stories of Brooklyn and Brooklynites, we have to go back to the primary sources. We scour through manuscript collections, we page through old newspapers, and we peer closely at rarely-seen prints, paintings, and photographs in order to reveal new depth and new layers to the history of this diverse and important borough. Of course, Brooklyn Historical Society’s team of historians wanted to give new life to the waterfront’s most well-known stories. After all, museum visitors would arrive hoping to learn about the Brooklyn Bridge, about longshoremen, about industry. But we also wanted to reveal a new waterfront to the public. We wanted to tell the countless hidden stories that people didn’t know about. We wanted to show the impact of industrial magnates and visionary architects on the coastline, but also the impact of starving artists, factory women, enslaved people, immigrants, and others whose stories are harder to find. A tiny newspaper obituary let us piece together the experiences of the family of Michael Harkins, an Irish-American dockworker who died in an 1873 accident at Empire Stores (the very warehouse that houses our new museum). Through a crumbling handwritten inventory, we revealed the story of Bet, an enslaved woman whose family was torn apart when each member was sold to a different owner in a 1798 auction at a waterfront estate. Using oral histories from our archives, we let a generation of World War II-era women tell of their trials and triumphs while working at the Brooklyn Navy Yard — in their own voices and own words. And we interviewed living artists who made the neighborhood of DUMBO home in the 1970s, decades before the once-industrial area became the tony residential enclave it is today. As WATERFRONT opens today, January 20, we hope that visitors will explore the history of a place that feels both familiar and strikingly new. The Brooklyn waterfront is a complex and layered place. Its history — and its impact on America and the globe — cannot be fully understood in one museum visit. Perhaps it can’t fully be understood even after four years of intense research. We hope Brooklyn Historical Society DUMBO visitors will come to love, as we at Brooklyn Historical Society have, peeling back the layers of the many histories of this ever-changing coastline. In the following months, we’ll be sharing even more — about the stories we tell in WATERFRONT, about how we came to find them, and about the ways we brought them to life in the exhibition. In the meantime, we hope you come visit the exhibition in person. For hours and directions to Brooklyn Historical Society DUMBO, visit our website. Originally published at www.brooklynhistory.org on January 20, 2018.